There was a game going around Facebook in the last few days, in which people would give lists of ten types of "something" that they've done, in which just one was false, and their friends have to guess which one is false. So I came up with a list of ten animals that I've been bitten by, but one is a lie! 1) Lion. Yep, I really was bitten by a lion. True, it was a very small lion, just a few weeks old. And he was only playing, I think. Still, even though this was a very small lion, just playing, and he bit my arm through a thick Timberland jacket, my arm was black for a week! 2) Hyrax. After years of raising hyraxes, I finally got my first bite two days ago. 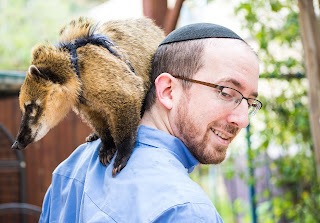 Luckily it was a baby hyrax; I would hate to get a bite from an adult male. Hyraxes are related to elephants, and even though they are only the size of groundhogs, the males have two sharp tusks. 3) Boa constrictor. Boas are not venomous - they kill their prey via constriction. However, they have very sharp teeth. This was probably the fastest bite I have ever received - it struck out in the blink of an eye and was all over before I even realized what was happening. 4) Leopard. Yes, I've been bitten by a leopard too, albeit a young one. 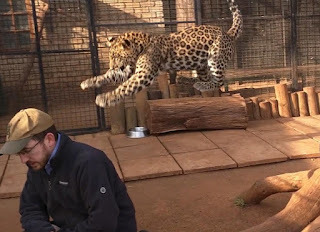 The new video playing at The Biblical Museum of Natural History includes an entertaining scene in which I deliver a devar Torah about leopards in which my dialogue is punctuated by gasps and shrieks as a leopard (larger than the one pictured here jumping onto me) playfully mauls me. 5) Parrot. Ouch. Eclectus parrots have particularly sharp, pointed beaks. Still, I fared better than a friend of mine, who was bitten by his eclectus parrot and part of its beak actually broke off, embedded in his hand. 6) Dog. I have never owned a dog or been bitten by one. 7) Monitor lizard. This one was particularly memorable. Monitor lizards are very large lizards which have especially nasty bacteria in their mouths (some scientists even believe it to be a form of venom). I was giving a lesson to a volunteer at The Biblical Museum of Natural History as to how to safely handle our monitor lizard (which was, fortunately, much smaller than the one pictured on the right). The volunteer pointed to our elbow-length metal-studded heavy-duty reptile handling gauntlets hanging from the wall, and said, "Don't you want to put those on?" "Nah," I laughed, "We're real men here!" Two minutes later I was screaming like a little girl as the monitor sliced into my hand. The amount of blood was quite astonishing, and the doctor put me on heavy duty antibiotics. 8) Turtle. You never forget your first bite. I was about eight years old when my tiny red-eared slider turtle latched onto my finger with his sharp beak. This was the longest bite I have ever received. He didn't let go, even when I shook my hand in the air! 9) Squirrel. I was buying some Indian five-striped palm squirrels from my animal dealer. We stepped into their enclosure, and he started trying to catch them with a net. As one of them streaked past me, I shot out my hand and grabbed it. Whereupon it fastened its incredibly sharp teeth in my finger. "You tried to catch it with your hand??!!" gagged the dealer. "Are you crazy?!" 10) Snookum bear. Yes, this is a real thing. Also known as a coati, and falsely believed to be known as a Brazilian aardvark. It's a sort of large South American racoon. Our current coati at the museum is incredibly tame, a real sweetie, but she did not like it when I put a harness on her for the first time! But she felt terrible about it and it's all in the past now. The list sounds pretty bad, but to put things in perspective, here's a list of animals that I have interacted with and not been bitten by: beluga whale, black bear, elephant, porcupine, hippopotamus, capuchin, kangaroo, ocelot, lemur, kinkajou, cheetah, okapi, giraffe, spider monkey, caracal, genet, sealion, hyena (both spotted and striped), wolf, walrus, eagle, vulture, skunk, alligator. So overall, my batting average is pretty good! Now, for a variant on the above. Here's a list of ten charedi gedolim who signed letters of condemnation against my work. But one of them once wrote a haskamah for my work. Can you guess which? The answer is the most extreme zealot of them all! Have you ever seen the movie The Freshman? It's one of my favorites, and is very funny, especially if you know The Godfather. It stars a komodo dragon, played in the movie by a Salvadori monitor. How many times after being bitten have you received shots for possible rabies infection? I was thinking Rav Shmuel Kamenetsky, but he's not on the list. Godol #4. I was probably there! Maybe you should leave the animals alone and stop locking them in your cages. As for taking on all those gadolim, may the Lord have mercy on you. He didn't take them on. They took him on. Actually, come to think of it, they took on Rambam and numerous other Rishonim. But how many charedi gedolim have you been bitten by? Who is the most extreme zealot on the list? How do you measure zealotry? Why does Rav Rav Elya Weintraub get two Rav's? Which of those gedolim have a venomous bite? Are the calling, by suggestion, these gadolim animals? Not nice and considering that one of them is Ovadia Yosef not smart. this is off topic. but just out of interest were you aware that after death covering mirrors was practised in victorian times.? In Victorian times, when the dead were laid out before the funeral, all the mirrors in the house were veiled to prevent the soul getting trapped in the mirror. This was practised across the world including in England, Scotland, America, China, Madagascar, the Crimea and Bombay. The custom still persists when Jewish families sit shiva. Just because other people do the same doesn't mean that Jews copied a non-Jewish practice. what happens if the minhag was adopted at the same time. Just a coincidence ? I hadn't tuned into your blog in quite awhile. I was kind of turned off, so I took a break. Just checked back now after several months' absence. Even if true, truly a pity that you had to ruin an otherwise nice post with nastiness at the end. Really disappointing. I guess it's time for another break. The equation of gadolim with animals isn't very seemly. Are you going to provide us the answer?